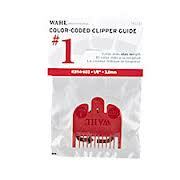 Fits all size Wahl clippers “Durable nylon comb “Easy, snap-on mounting““Walhl color-coded comb attachment allows for quick identification and maintains a precision length. 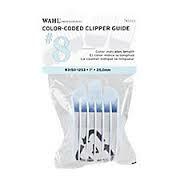 Fits all size Wahl clippers. The Andis 01382 snap on blade attachment combs fit Andis models MBA, ML and SM. It leaves hair 1 long. Fits Clippers – Master, Phatmaster, Ceramic Select Cut. Fits Only the Non-Surgical Style Blades. Black Plastic Comb w/ Metal Clamp on Back. The Andis 01381 snap on blade attachment combs fit Andis models MBA, ML and SM. It leaves hair 1/2 long. The Andis 01597 snap on blade attachment combs fit Andis models MBA, ML and SM. It leaves hair 3/8 long. Fits andis clipper models: ml improved master and fade master, MBA select cut and ceramic power fade and SM speed master, SM trendsetter adjustable, SM track mate and gc deluxe groom clippers. Black plastic comb with spring metal clip to hold comb on to blade. Adjusts for five different lengths. Easily adjusts.Won't snag or pull on hair. Varies from 1/8 to 5/8. No need to buy additional guides with this adjustable trim guide. 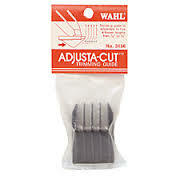 Varies from 1/8 to 5/8 and fits an assortment of Wahl trimmers. It easily adjusts and creates smooth even trims and outlines. Fits trimmer 8900, 8900-500, 8040, 9985 and Omega.